Simulated "Martian gardens" allow NASA scientists to test which plants can be grown on Mars. This photo shows the results of a preliminary study on lettuce plants. From left to right: lettuce seeds grown in potting soil, Martian simulant with added nutrients, and simulant without nutrients. Simulated "Martian gardens" are helping NASA scientists learn which plants astronauts might be able to grow on the Red Planet. A human round-trip journey to Mars may take as long as two and a half years, and one major challenge for these kinds of extended missions is determining how to pack enough food for those astronauts. As such, scientists are studying ways for astronauts to grow their own crops and extend their food supply, because seeds take up less room and have a longer shelf life on spacecraft than full-grown plants do. Farming on Mars is much different from farming on Earth. Martian soil consists of crushed volcanic rock with no organic material, making it nearly impossible for plant life to survive, according to a statement from NASA. "We are using advances in science to learn about increasing plant production to supplement astronauts' diets," Trent Smith, project manager for the Vegetable Production System (Veggie) experiment at NASA's Kennedy Space Center, said in the statement. The Veggie experiment has allowed astronauts to garden in space and conduct experiments on plant biology on the International Space Station. The soil being used in the "Martian garden" was collected from Hawaii and chosen because it simulates the kind of soil found on Mars. Using this Hawaiian soil, the researchers tested how much soil should be used, and which nutrients should be added to the soil, for the various crops to achieve optimal growth. For example, the researchers tested how lettuce grows in the Mars-like soil simulant. They compared their results to lettuce plants grown in the soil simulant with added nutrients, as well as lettuce planted in normal potting soil. 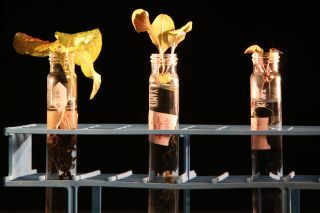 This experiment revealed that the lettuce grown in the Mars-like soil simulant with no added nutrients tasted the same but had weaker roots and a slower germination rate (in other words, they took longer to grow), according to the NASA statement. In the future, the researchers plan to test how crops such as radishes, Swiss chard, kale, Chinese cabbage, snow peas, dwarf peppers and tomatoes fare in the Martian soil simulant. "Discoveries made in these Earth-based 'Martian gardens' will pave the way for future studies and technology development in terms of reliable, efficient food production a long way from the home planet," Ralph Fritsche, senior project manager for food production at Kennedy Space Center, said in the statement. "We're right at the cutting edge of this research."